File photo of a metro bus. Photo by Brian Addison. As I stood at The Promenade and Ocean Boulevard at 7:55 a.m., waiting to experience Metro’s rollout of its Blue Line substitute shuttles, I felt like my behavior over the weekend was going to be a reflection of the day’s ride. 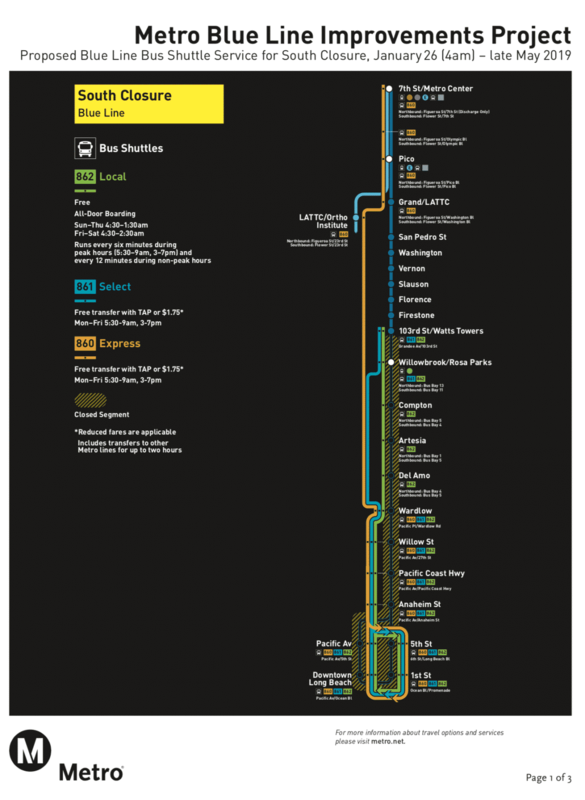 Just yesterday, My Dude and I were thinking of heading to Los Angeles, like we often do, via the Blue Line—until I was reminded of the closure: Without an express shuttle—the one I hopped on this morning—that means we would have to hop on Metro’s 861 or 862 lines from Downtown, connect at the 103rd/Watts Tower Station, and then take the Blue Line up. And after speaking with Long Beach resident Daniel Ryan Lucero’s experience about that very ride he took on Saturday, it wasn’t looking pretty: Over 100 minutes to get from Downtown Los Angeles back home. Ultimately, we ended up driving because we are privileged enough to have a car. And it was this precise decision that made me fear that many Metro users were going to be in for a headache: There are the owners who choose transit out of both ethics and convenience and are likely going to skip Metro’s proposed alternatives and, getting ripped off the most, those who depend on public transit because they have no alternative. 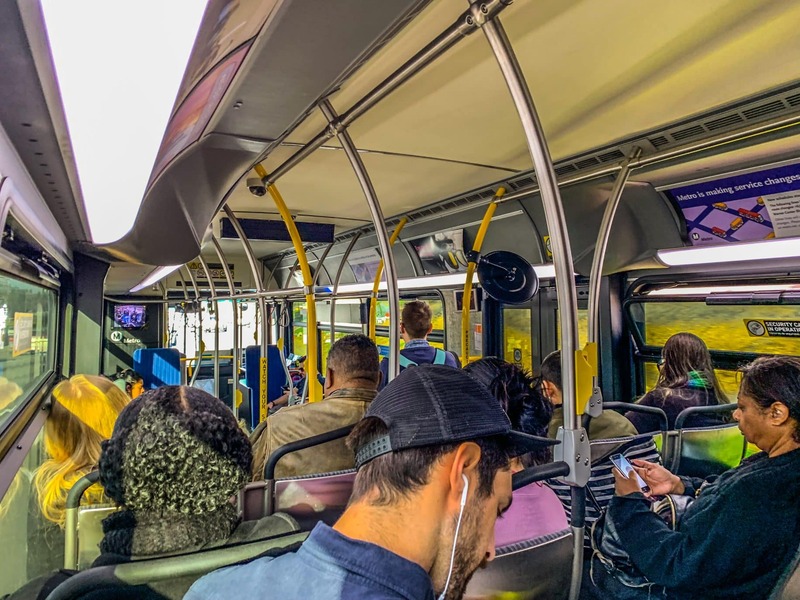 In fact, Long Beach resident Natalie M. Hernandez created a Facebook group, LA Metro Blue Line Riders, in the hopes of keeping those with cars on the shuttles and those without them connected to information as to how to best get around. 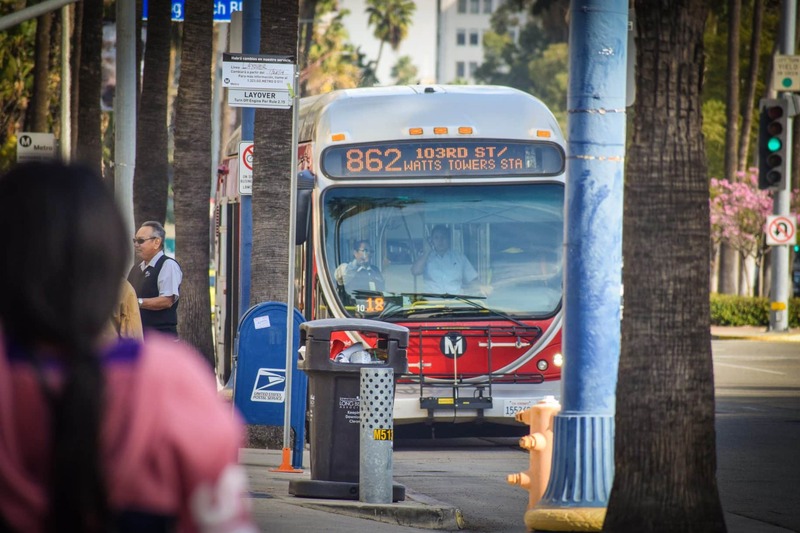 Today marked the first day of Metro’s 860 Line, an express shuttle that starts at The Promenade and Ocean Boulevard. Much to my surprise and happiness (and something that occurred at every single portion of my trip), Metro employees were ready and happy to talk to passengers. If anything, it immediately felt organized, human-focused, and comfortable. After that, all 860 trips head onto the 405 freeway before joining the 110 FastTrak lane—strangely not using Metro’s Silver Line path in the middle of the 110, which given the traffic that even occurs in the FastTrak, would be a much better alternative—for a direct trip to Downtown Los Angeles, with stops at Pico and Seventh St./Metro Center. For those seeking immediate comfort in numbers: The Metro’s 860 Express Shuttle was relatively speedy. After leaving at 8:05 a.m., we arrived at Pico Station in 67 minutes and Seventh St./Metro Center in 74 minutes. For those in Wrigley, for example, my bus—a 40-foot XN40 bus rather than a 60-footer, which rather shocked me—was already full by the Willow stop; people were left waiting at Willow for the next bus while we didn’t even stop at Wardlow due to capacity. It was a stark reality that the myth about no one using transit in the Los Angeles region is just that: a myth. Metro’s 860 express line is filled to capacity as it trekked along the 405 before hitting the 110 FastTrak to Downtown Los Angeles. Photo by Brian Addison. 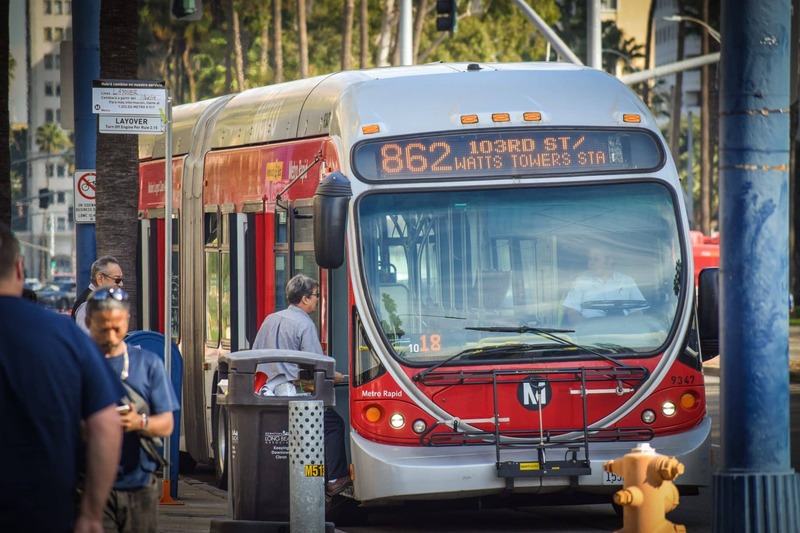 For those who need any stop between Wardlow and Pico stations, you are forced to deal with Metro’s 861 or 862 lines, the latter of which is free and the former of which is available only during the weekday peak hours previously mentioned. And for those who work on the weekend or need access during non-peak hours, this isn’t an alternative. As for those taking the much less-used route from Downtown Los Angeles to Long Beach, Los Angeles resident Alex Yee noted that his trip took 59 minutes after leaving Seventh St./Metro Center at 8:12 a.m. However, this is the morning and I deeply worry over the design and congestion of Downtown Los Angeles being able to the flock of folks seeking to head back home during afternoon rush hour. Despite this, I felt compelled to take the other route back because, after the smooth ride that skips the entire South Central area, I wanted to know what folks were dealing with if they depended on the Blue Line’s entirety. It’s not fun, despite Metro’s efforts to accommodate. Metro’s 862 line at its last stop in Downtown Long Beach. Photo by Brian Addison. I hit the Blue Line at Metro Center, with the train heading toward its final stop of 103rd/Watts Tower at 9:33 a.m. in order to meet with Metro’s 861/862 lines. Unlike many mornings taking the Blue Line, the train was mostly empty and there was also a sense of spirit lost: Had it have been during any other period of its history, the Blue Line would erupt with conversations, music, and, at least in this century, some sort of seller who still thinks DVDs are a viable source of pirating. So I spoke to Leti Mercado, a lone 15-year-old high schooler from South Gate, as she connected from visiting a friend in Los Angeles. It felt, looking around, that most had gone somewhere else, though the capacity began to pick up as we headed further from Downtown Los Angeles and more toward 103rd. After that, what I thought was a mostly empty train was anything but: Tons of folks began to line down the ramps, waiting to cross the tracks in order to access the 861, which was out of service by the time I arrived, or the 862. Blue Line riders, after exiting at the 103rd/Watts Towers station, wait to cross the tracks in order to access Metro’s bus shuttles to continue their trip south. Photo by Brian Addison. 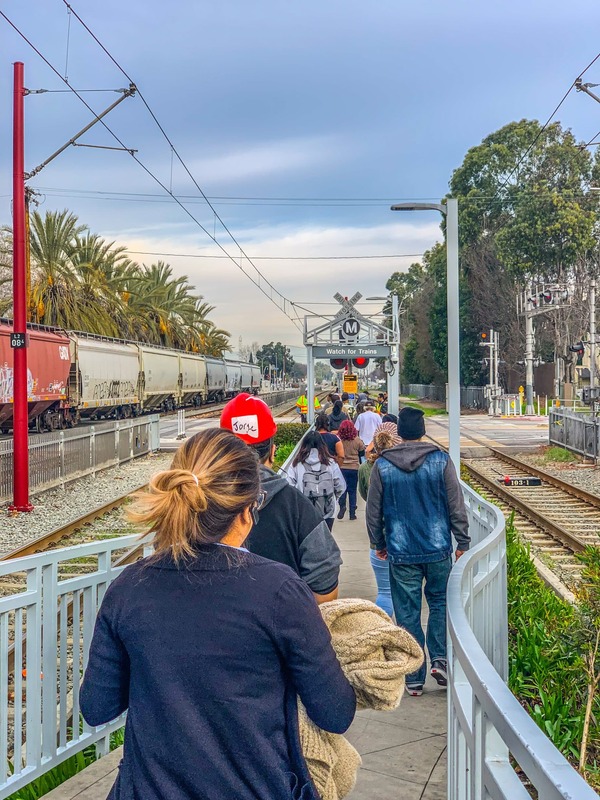 By the time I got on the 864 and began moving, it was 10:04 a.m. and we began what would end up being a 74-minute trek to Downtown Long Beach, making the entire connection between Metro Center and the end of the line an exhausting 102 minutes. Which yet again leads me to a frustrating conclusion: For those who depend on the Blue Line’s “in-between” locations that aren’t just its polar ends, getting there is going to take time—and a lot of it. So some things, despite valiant if not outright applause-worthy efforts this morning, need to be tweaked. Lucero’s suggestion makes sense: If Long Beach Transit or Metro connected, they could create a bus line that goes from Wardlow to the Harbor Transit Gateway in San Pedro; this would connect riders directly with Metro’s express Silver Line to Downtown Los Angeles. “Seven days a week with 30-minute headways through rush hour followed by 60-minute headways after 9 p.m. until the end of service and an added alternative,” Lucero said. Metro, seems like you should listen to your riders.